floral maid of honour bag by Alphabet Wedding Bags | Wedding Shoes by Alphabet Wedding Bags | Bridal Shoes by Alphabet Wedding Bags from Arabesque. 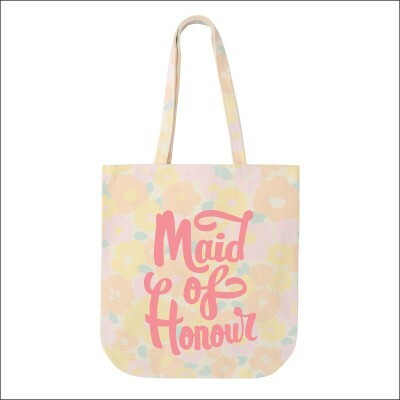 A beautiful floral canvas tote bag by Alphabet Bags, perfect for your marvellous maid of honour! Fill with little gifts and let her carry out her duties in style. They are perfect for hen parties and also make a lovely keepsake to treasure beyond the big day. The floral illustration has been printed in pastel tones on thick and sturdy natural canvas and hand printed 'Maid of Honour' in a beautiful bold pink.